Atul Gawande’s “Being Mortal: Medicine and What Matters in the End” gives you a roadmap for how to navigate one of the most sensitive, important, and often ignored subjects: end of life care. Through personal anecdotes and medical studies, he talks about different options for care and the way those options have changed over time. Gawande spends a lot of time on how patient communication has changed. One of the primary takeaways is to ask the questions: What are your priorities? What makes life worthwhile to you? Answers like being able to eat chocolate ice cream and watch football, or being able to sit at the dinner table, shape how end of life care is evolving for individuals and institutions. Gawande stresses the importance of asking these questions continuously as priorities change. When patients are clear on what is important to them, decisions at difficult times become easier. 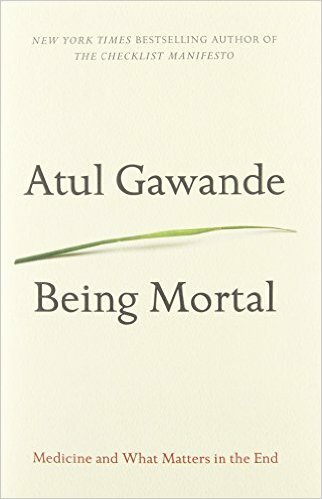 Gawande guides us through topics that can be considered taboo and empowers us to make our lives what we want them to be, all the way until the end of life. Building meaningful and lasting relationships and spending time outside. – Amanda C.
Advocating for others. Teaching others and learning from others. Learning an obscure fact about food science, applying that fact and making a good meal that puts a smile on my loved one's faces. – Amanda M.
What other books and resources have you found that have empowered you or a loved one to have the best possible care? We’d love to hear from you on facebook or twitter!